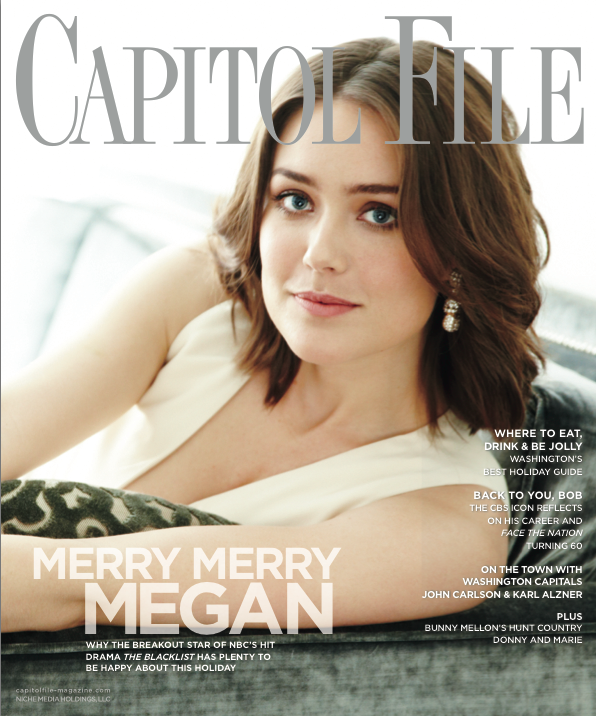 Capitol File released its new holiday issue today with Megan Boone, star of NBC’s hit drama The Blacklist and total babe, on the cover! Inside the annual holiday issue, Boone reveals why she enjoys living on the East Coast and dating in New York City, talks James Spader’s iconic fedora hat, shooting in Washington and of course, Capitol File’s Editor-in-Chief, Elizabeth Thorp couldn’t resist asking the actress for a few insights into this season of The Blacklist. There’s also a great profile on the fabulous Bob Schieffer on the 60th anniversary of Face the Nation and his legendary tenure at CBS. Editor at Large from The Atlantic, Steve Clemons, penned the Schieffer piece. A little birdie told us that Megan is coming to town for a Capitol File holiday soiree…fingers crossed we get an invite. Photo Courtesy of Nigel Parry.